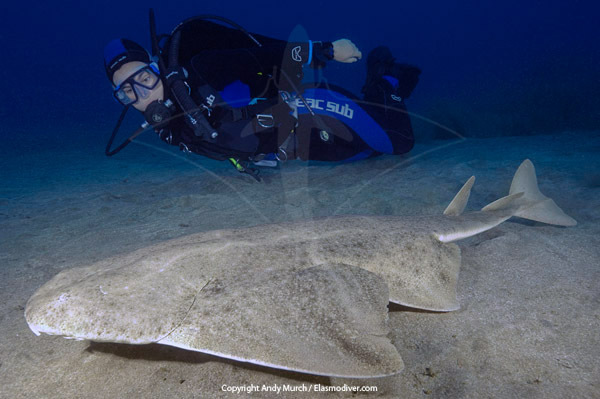 Diving with Angel Sharks in Gran Canaria, Canary Islands. 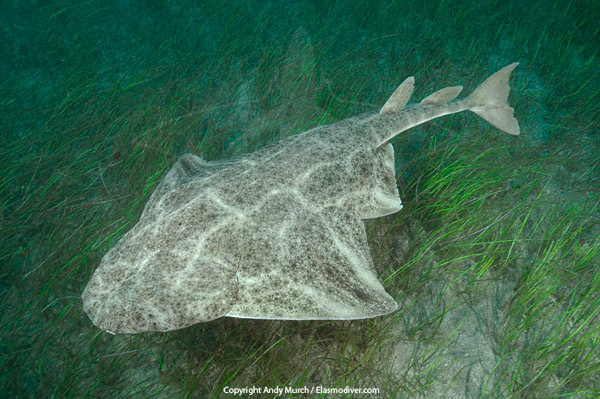 Encounter: Common Angel Sharks. The common Angel Shark (Squatina squatina) is now not so common in much of its northern range. In the North Sea it is commercially (and possibly literally) extinct. However, in the Canary Islands it is still an abundant enough species to be encountered regularly in some areas. Close to the small town of Arinaga on the south side of Gran Canaria, there is a marine park called El Cabron which has a resident population of Angel Sharks that can be encountered naturally while shore diving. More sharks are present in the winter months but unlike many places in the Canaries, the El Cabron population remains close to shore (though in lesser numbers) even during the warmest summer months. All diving at El Cabron is done from shore. An unpaved road leads to the park but the web of primitive pot holed tracks can be confusing and the entrances to each dive site are not marked. Also, the sharks themselves usually bury under the sand for much of their time so so it is important to enlist a local guide. The sharks can be encountered in very shallow water but usually rest close to the reef below about 10 to 20 meters. They are quite docile and can be closely approached with non threatening movements. It is usually possible to wave some of the sand away from them before they move away. Other Elasmobranchs: Marbled Torpedo Rays, Round Stingrays, Pastinaca Rays (Common Stingrays) and Butterfly Rays. Many butterfly ray beds (marks in the sand) can be seen at El Cabron but the animals themselves are more difficult to find. This may be because they only move inshore at night. Operators: Many dive shops on Gran Canaria visit El Cabron but the most conveniently located shop is Davey Jones Diving in Arinaga. The owner / manager Brian is an eagle eyed guide and keen naturalist with a knack for finding Angels under the sand. His store has been instrumental in collecting data on shark sightings for an ongoing university study. If you dive with Davey Jones your shark encounter will be entered into the survey to help build a better picture of the shark's movements. Accommodation: There are a number of accommodation options in Arinaga which is a small, pleasant tourist destination. Davey Jones can organize inexpensive studios with a little notice. Bear in mind that at cetain times during the summer the town explodes with local holiday makers escaping from the city. Call Brian well in advance if you plan to arrive at that time. Directions: Arinaga can be reached by road from the city of Las Palmas. Although it is possible to drive into the park and leave your vehicle where other divers are obviously entering the water, it is wise to sign up for a dive with one of the local shops to save your suspension over the atrocious dirt roads.